Japan’s leading career earner in poker tournaments, Masaaki Kagawa, was one of nine men arrested recently by Japanese authorities as part of an investigation into an online-fraud ring including the sale of $3.9 million worth of bogus online-dating site subscriptions obtained via phishing through a malware-loaded Android app. Kagawa, a 50-year-old entrepreneur known as “Masa” on the tournament circuit, is alleged to be the ringleader of the operation, in which malware variant called “Android.Enesoluty,” which appears to have been developed from earlier malware variants and was injected into the Android world sometime around June of 2012. Symantec, in a detailed feature on the busting of the ring, noted how the bug was inserted into apps associated with a popular Japanese anime character, and then used to phish for e-mail addresses, which were then spammed with ads for a bogus Japanese dating site called Sakuro. At one point, after Symantec outed many of the specifics attached to the fake app, Kagawa’s group even attempted to graft a EULA agreement into the scamware in a belated attempt to make it legal, though by that point the Japanese feds were long on the case. The Japan Daily Press story that announced the arrests quoted a Symantec researcher as saying that Kagawa and his group may also have been involved in selling the phished e-mail addresses to other global spammers. All told, the apps controlled by Kagawa’s group are alleged to have infected 810,000 Android devices and phished some 37 million e-mail addresses. The various reports allege that at least some of the operation was carried out through Kagawa’s Koie Planning company, a Japanese firm that is variously described as being in technology and event planning. Kagawa’s rise as one of the few internationally recognized Japanese poker players came as a result of a couple of large scores at the Aussie Millions. 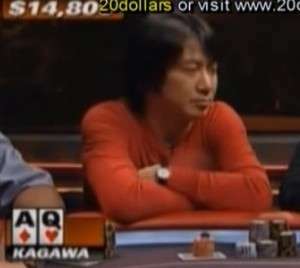 Kagawa’s breakthrough cash on the international tourney scene came at the 2007 Aussie Millions, where he pocketed almost $200,000 for a third-place finish in the main event. Six years later, this past January, Kagawa reprised that third-place showing in the same Aussie Millions main, this time cashing for $337,000. In between, Kagawa traveled the globe to occasional events and logged a couple of six-figure EPT scores, include a career-best $468,030 at last April’s EPT Super High Roller event in Monte Carlo. Japanese officials have yet to release a complete laundry list of charges in connection with the investigation, though if found guilty, Kagawa and his associates could face anything from hefty fines to prison terms. Infected malware apps have become endemic in Japan in elsewhere, with a separate Symantec study alleging that as many as 35,000 Android malware apps already exist. It’s also not the first time that a high-profile Pacific Rim pro has run afoul of the law in recent years. David Saab, another Aussie Millions / APT frequenter, remains in prison, serving a 14-year term, after a 2011 arrest and conviction on cocaine-trafficking charges.